This Yellow Warbler was photographed by Robert Shantz. Juan Miller Road at Blue River north of Morenci, Arizona March 31, 2004. 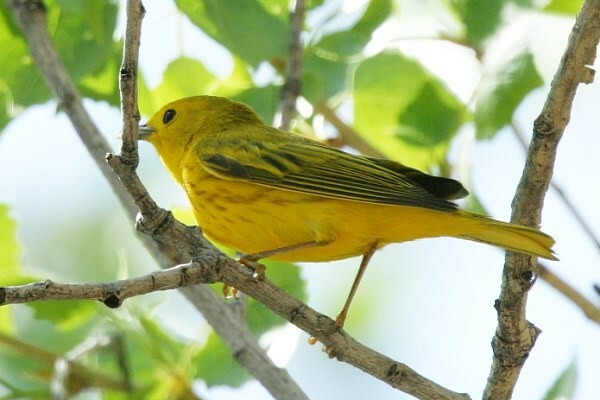 Where there are sycamores, willows, or cottonwoods in Arizona there are likely to be Yellow Warblers. Males are largely bright yellow with reddish streaking on the breast and brownish-gray wings; females are largely dull-yellow. Warblers are largely insectivorous and their principal foods are caterpillars and other arthropods cleaned from foliage. Their breeing season coincides with the the peak populations foliage-eating insects in mid-spring. Generous summer monsoons might trigger a second breeding. During the winter months these migrants return to the tropics where insect prey remain available.